Erika became an avid reader at a very early age, thanks to her dad who introduced her to many great books. Erika writes urban fantasy, alternate history, epic fantasy novels as well as fun, educational and bilingual books for children ages 2-14 about acceptance, friendship, family, and moral values such as accepting people with disabilities, dealing with bullies, and not judging others before getting to know them. In her quest to protect her family and the future of our clan, Ilona must activate her Chameleon ability and obtain unimaginable powers. She can use her powers for absolute good or absolute evil; the choice is up to her. Durante siglos, Morana esperó el momento adecuado para reunirse con su amado Joland y conseguir el poder necesario para gobernar el clan ancestral, que aún persiste oculto entre nosotros, con su estricta jerarquía, reglas mortales y tradiciones. Ilona no sabe que ha sido elegida para detener el malévolo plan de Morana. Tampoco sabe nada acerca de su legado personal ni de leyendas o rituales, cuando comienza a recordar las instrucciones de su madre, ocultas entre rimas. No es consciente de que su tranquila vida como doctora está a punto de cambiar y que se verá arrastrada a un peligroso mundo lleno de secretos. El descubrimiento de su poder de sanación y su capacidad de detener el tiempo son a la vez, emocionantes y aterradores. Aparece un hombre siniestro e Ilona relaciona su presencia con una serie de misteriosas muertes a su alrededor. Por otro lado, habiendo estado enamorada en secreto de su mejor amigo, de repente, se siente atraída por el extraño que aparece en su sueño, sintiéndose muy confundida por el fuerte sentimiento de atracción. 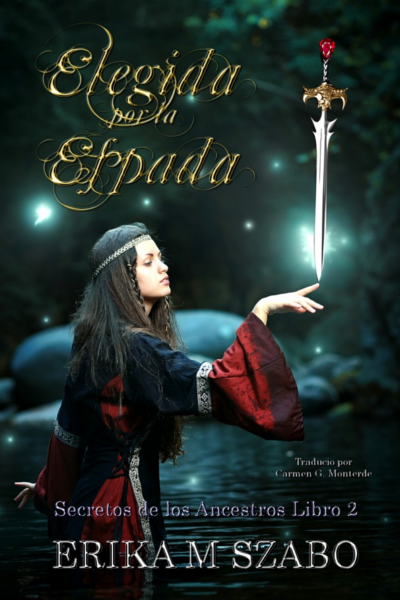 Amor, antiguas leyendas tribales, secretos, viajes en el tiempo y poderes mágicos, colisionan en una irresistible serie de fantasía, aclamada como original, mística y única. A little girl teaches her family and her friends how to relate to someone who is hearing impaired. This fun picture book carries an important message to children, how to learn not to judge or make fun of anyone just because they’re different. The life of any disabled person is no fun and living with a disability has many challenges, but we can help to make their life easier and not harder. When Grandma Rosa lost her hearing, Sandra’s parents became frustrated and sad. They didn’t know what to do and how to learn to communicate better with her. They tried shouting, changing the tone of their voices or leaning closer to her ear when they talked, to no avail. Rosa could hear some sounds clearly, but certain sounds she couldn’t hear well. It became an everyday struggle for them, and they missed the comforting family conversations at dinner time. “What do you mean showing it with your fingers?” Grandma Rosa asked. “I found a website for hearing impaired people, and it explains how they can talk to each other without words. There is a sign for every letter and number that they can make with their hands. We can learn the signs together,” Sandra smiled happily. “Of course, you can, Grandma, we can learn them together. And they did. They proved that with compassion, love, and hard work, they can overcome the obstacles of disability together. MIRA, PUEDO HABLAR CON LOS DEDOS! Y lo hicieron. Ellas demostraron que con amor, compasión y trabajando duro se pueden superar los obstáculos que conlleva la discapacidad auditive. ​Terry is sad because she can’t find her precious music box that was a gift from her Grandmother. With the help of her dog, Pansy, and the wise hedgehog, Oliver, they cross the portal to the magical world and Pansy leads them to Wolfgang’s cave. 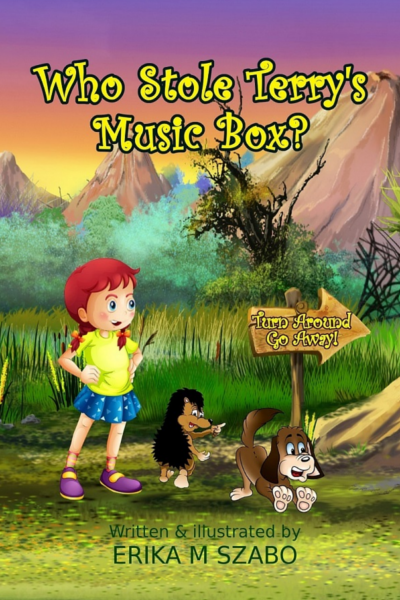 Terry finds out why she has the ability to talk to animals and why the good witch enchanted her music box so long ago.